Two of the great loves of my life, professional wrestling and comics, wrapped up in a single package? And written by Dennis Hopeless, one of my four colour gurus of choice? How in the name of ECW have I not heard about, or read this book until now? Well, I guess it’s better to arrive at the party late than not make it all. So even though how WWE slipped under my radar is a Scooby Doo sized mystery with no answer in sight and with no obvious, masked ne’er do well lurking and pulling levers behind a velvet curtain with the words “Nothing to see here” painted on it in six foot high day-glo letters to take the blame, I guess I’m going to have to put it down to bad luck and the fact that fate hates me. That said, now that Redesign… has been released, it gives me a chance to begin to play catch up with Hopeless’ stories of the square circle. Is Redesign, given the way I feel about the medium being used to tell the tales of the sport of Kings that I adore and the high esteem in which I hold the author, everything that I hoped it would be when it first arrived? Oh yes. Yes it is. And so much more. 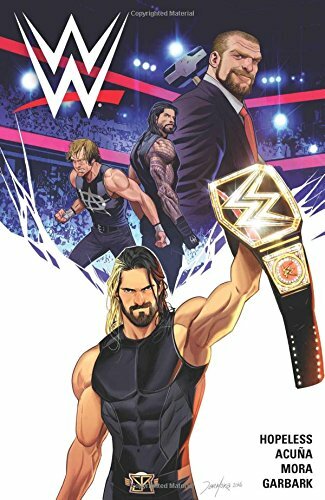 Diving headlong into, and assuming that reader has at least a passing familiarity with (because after all, Wrestling fans are this books target audience), relatively current WWE storylines, this initial volume of the book focuses on the Shield’s (a wrestling faction composed of Dean Ambrose, Roman Reigns and Seth Rollins) initial fall and how one of its members, Seth Rollins, betrayed his brothers in arms in order to pursue his dream of becoming the greatest champion of all-time regardless of the personal cost to him or those closest to him. Combining on-air and actual WWE storylines with a wonderfully detailed and inventive behind the “scenes” plot that sprung straight from the imagination its writer, Redesign… nails every aspect of Wrestling business, adds a ton of pizazz, amplifies everything by a factor of ten and turns the colour commentary and Jim Ross-O-Meter that charts Rollins rise, fall and rebirth up to eleven before snapping the dial off and just let everything gallop to its riveting conclusion.